If you are still working on getting your yard in shape, here are some techniques for water conscious landscaping. Xeriscaping is the art/science of landscaping with reduced need for irrigation. It offers several benefits, besides just saving water. It requires less maintenance, reduces the need for chemicals and fertilizers, increases property value, reduces air pollution, and provides wildlife habitat. It focuses on drought-tolerant and native plant species, with limited grass turf areas. 1. Design for water conservation. Landscape design is very important in xeriscaping. Analyze the area to be landscaped for sun exposure, water drainage patterns, and expected use. These areas will help to define what plantings should go in what area. Group species with similar water and sun needs together. Tour local nurseries to find out what plants are available in your local area. The ideal soil in a water-conserving landscape does two things simultaneously: it drains quickly and stores water at the same time. Adding compost and keeping the soil aerated helps keep it in prime condition. The only exception is for cacti and other succulents, they prefer soil without much organic matter. 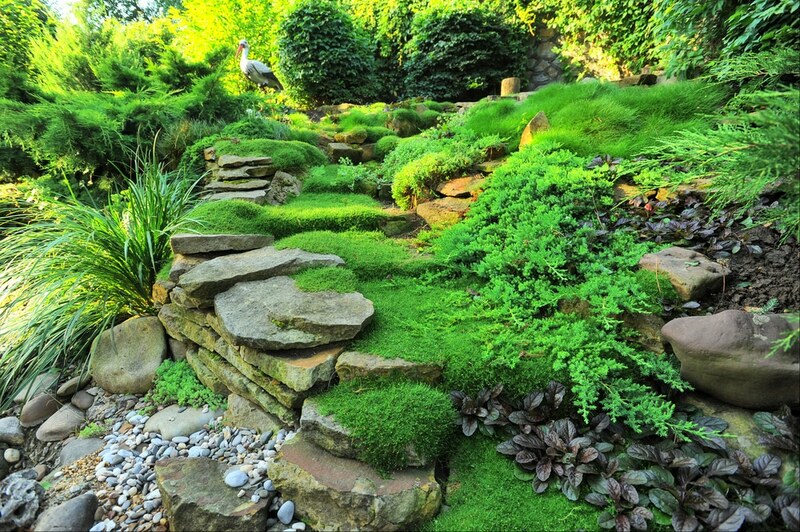 It is okay to provide limited grass turf areas in your landscaping. They add visual appeal. Plan these areas with ease of maintenance in mind – use shapes that are easier to mow (think curves) and in areas that are more easily accessed. Look for grass species that don’t require as much water and are adapted for your local climate. Native and drought-resistant plants are your best overall choice, but select for the specific site characteristics. If there are marshy or wet areas, use plants that are designed for that type of environment. The most important thing is to not mix plants with different water needs in the same planting area. 5. Cover areas around plants with mulch. Mulch helps retain soil moisture and temperature, prevent erosion and block out competing weeds. Organic mulch will slowly incorporate with the soil, and will need more applied, “top-dressed”, from time to time. To be effective, mulch needs to be several inches thick. There should be no areas of bare soil. 6. Water plants, but don’t over water. Soaker hoses and drip-irrigation systems are best as they deliver water directly to the plants, without watering other areas. It is best to water deeply and less frequently. 7. A little bit of maintenance. Weed your landscape as necessary. Mulch helps to reduce weeds, so lay it on thick. Grass should not be cut too short. Longer grass provides a natural mulch to help roots retain water. Don’t over-fertilize. For more ideas, see this post from our archives.